WHAT IS SINGLE FILE PHP GALLERY? Single File PHP Gallery is a web gallery in one single PHP file. All you have to do is copy the script to any directory containing images to make a gallery. Sub directories will be sub galleries. 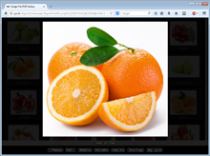 Thumbnails for images and directories are generated automatically. Single File PHP Gallery does not require any configuration or programming skills to use. For private non commercial use Single File PHP Gallery can be used for free. When used commercially a donation for at least 10$ must be made per domain where it is used. See readme.txt for full EULA. You are of course still more than welcome to donate if you like the gallery, even though you only use it privately. PHP memory limit large enough to contain both full size image and preview/thumb (converted to BMP) See the FAQ section in readme.txt for further information on this. 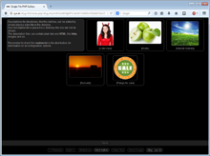 Added option "DELETE_EMPTY_DIRS" to have the gallery delete empty directories. This option is disabled by default. Added "Invert Selection" button in ADMIN menu. Can be used to selece/deselect all items. Added option "THUMB_PNG_ALPHA" to allow transparency in PNG thumbnails. The option is enabled by default. Delete old thumbnails to have new transparent generated. Fixed so that preview images is not squared when THUMB_SQUARE is set to TRUE. Fixed a vulnerability in PayPal option, that could allow script in crafted URLs to run in client browser. The vulnerability was only present with PayPal option enabled. Fixed so that the information box stays closed when closed by user. It was a problem when changing directory with SHOW_INFO_BY_DEFAULT enabled. Fixed so that preview text box is not shown when preview is disabled. If you are having problems getting the script to work, then please download the SFPG TEST script from the DOWNLOAD section above, and paste the output from it into the message, along with a description of the issue you are having.